We like to remind others we have sacrificed sleep to train. We write books about it. 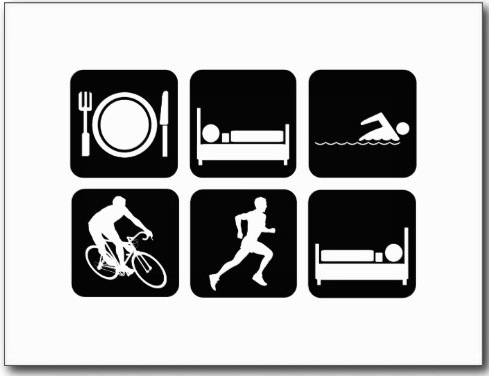 We make pictograms of our activities -- with not one, but TWO beds. 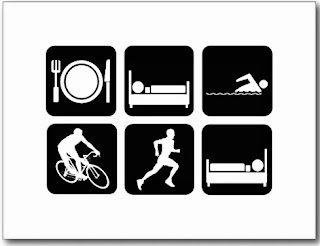 You can Google "Triathlete Sleep" and enjoy the 3.9 million resulting links! 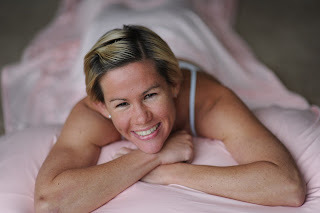 There are tons of articles written about the importance of sleep. With early morning swims and runs and late nights up nurturing our Type A overachieving personalities we burn the candle at both ends. I probably average 6 hours of sleep a night. Sometimes I'll have a streak of 5 hours. That's not good, I know. I rarely ever need an alarm and am up by 5 or so most days. This past week, coincidentally, I had numerous people comment on my sleep. It started when a now-graduated student of mine posted this quote that yes, I do recall saying, on my Facebook wall, "You need to do things that get you out of bed in the morning and keep you up late, being tired half the day but not caring because you love what you're doing" - Cortney Martin. Guilty. I had been talking about finding your passion. 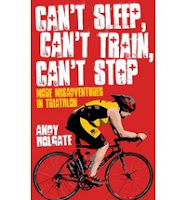 Then shortly after, I was doing some late-night work/emailing and the final email back (he's a tri coach) at 10 pm said "thanks, and go to bed!" A few days later, a near midnight Facebook post alerted a friend that I was still up, and I got a text message saying I should be in bed and this was not a good time (pre-Boston) to mess with my sleep patterns. Then my son's friend (age 12) who is a frequent sleep-over guest, commented not once, but twice, how amazed he was that I stayed up until midnight. Funny!! I'm taking the hints and I am going to work on my sleep schedule and see if I can't get a little more of that precious commodity. I'd better finish this post, queue it up for the morning, and get to sleep ;-) By the time you see this I will be at the pool...a mere 9 hours from now. There we will surely exchange rounds of, "how did you sleep?"